Many Communists, leftists, and even patriots (I’m sorry to say) have a pronounced tendency to make out the Soviet economy as not quite the resounding failure it really was – or even to paint it as a success story that was only brought down by perestroika and liberal reforms. 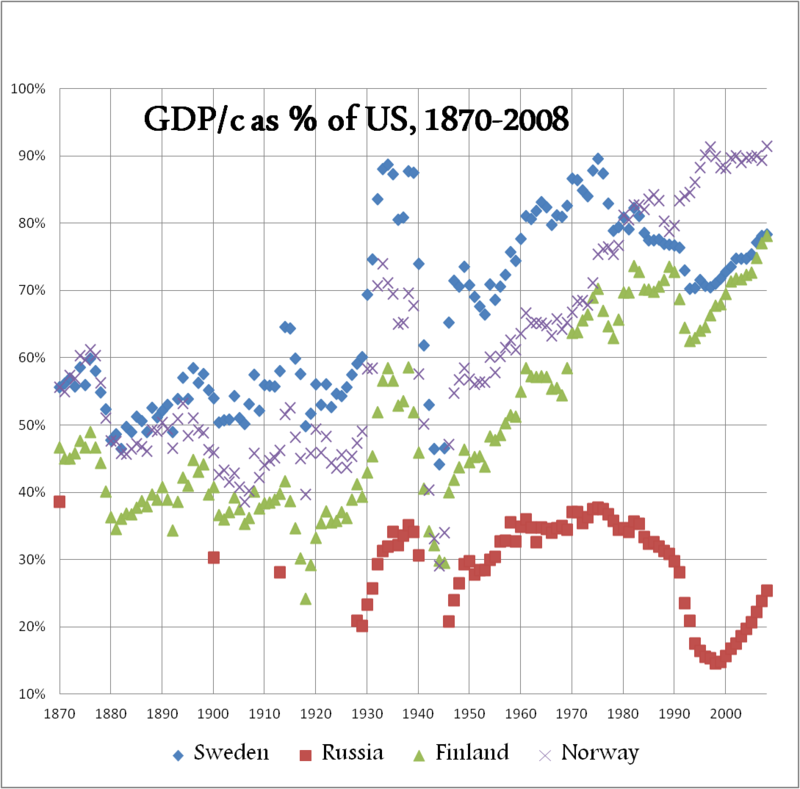 The above chart – based on historical GDP per capita (Geary-Khamis 1990 Int$) by Angus Maddison, compiled by liberal economist Illarionov, popularized online by Lopatnikov, and Starikov – purports to destroy two “myths”: That of (1) Prosperous Tsarism, and (2) The ineffectiveness of the Soviet economy. After all, the average Russian went from being 40% as rich as the average American in 1885, to only 23% by 1917; whereas during the Soviet period, despite the turmoil of two major wars, Russian incomes reaches a relative peak at 40% of American levels during Brezhnev’s “stagnation” period. 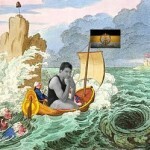 These is however a glaring hole in this logic, namely that (1) relatively slow growth under late Tsarism reflected a permanent state of affairs, as opposed to the heavy but temporary burden of a large rural, illiterate population; and (2) that a level of per capita GDP that is a mere 40% of what Americans enjoy was in any way a fulfillment of Russia’s potential during the 20th century. In fact, graphical comparison with other countries shows this to be almost certainly false. I replicated the graph comparing Russia’s historical performance relative to the US, but adding in another reference – those south European countries that were broadly comparable to Tsarist Russia in terms of economic development at the turn of the century (i.e. both were backward), but were spared from the distortions of central planning. (I could only find figures for the Russian Empire/the USSR as a whole, not Russia specifically, hence the slight disparity from the first graph; but the trends would remain the same). You can click on the graph to view it in higher detail. 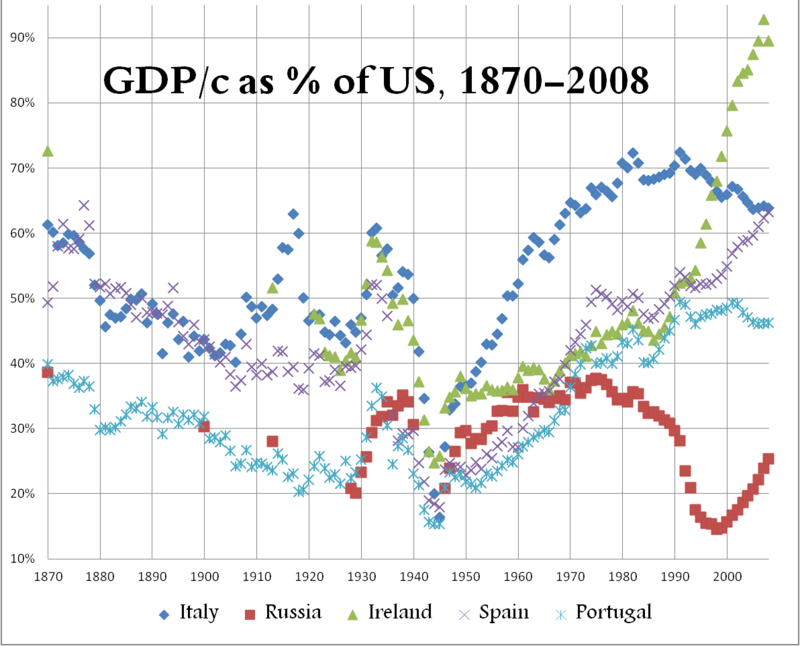 (1) While it is true that Russia was losing ground relative to the US under late Tsarism, or at least until 1905 (see first graph) – the same was true for all other backward European economies. In fact, the Russian Empire tracked Portugal almost exactly. But bear in mind that Russia in 1870 was 90% rural and illiterate, a state of affairs utterly nonconductive to industrial development; and agriculture’s potential for productivity gains is extremely limited, especially in the context of the system at that time. In contrast, the US was almost universally literate and embarking on its great industrial boom. It is no wonder then that the relative gap between the US and Russia increased from 1870 to 1905 (why the gap existed in the first place can be traced back centuries and is far beyond the scope of this post). Notice that the same thing was happening in all the other similarly backward countries: Portugal, Spain, Ireland, to a lesser extent (but more developed) Italy also all lost ground to the US from 1870-1913. (2) The Soviets inherited Tsarist infrastructure, hence the period until 1925 was simply one of restoration. It should also be noted that the literacy rate by 1916 was around 50%, i.e. 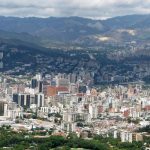 in terms of human capital development, much of the legwork had already been done; that is, the country was ALREADY ripe for a faster rate of industrialization, that would have happened regardless under any political regime. Nonetheless growth began to flag by the late 1920’s, as Tsarist-era production levels were restored. It was only further turbocharged from 1930 on by forced savings via collectivization and consumption repression, and German and American investment. But even so note that the sharp rise in the early 1930’s was in large part an artifact of the Great Depression that wracked the US, and that in that period ALL countries rose upwards, and that the USSR failed to make substantial gains on the US standard of living following the mid-1930’s; indeed, Soviet GDP actually fell in 1940. Needless to say this growth was also achieved at much higher human cost than elsewhere. (3) Everybody suffered from the wars and the collapse of trade during the 1940’s. The USSR did start recovering earlier, showing strong growth relative to the US during the 1950’s and to a lesser extent during the 1960’s; it also held its own against what were still the weakest West European economies, that is Portugal, Greece, Spain, and Ireland – although Italy sprinted far ahead. The fast growth during this period was structurally similar to the US some fifty years prior: The large-scale shift from agriculture to industry, which is a one-off in historical terms. (5) Yes, on the one hand, this collapse wouldn’t have happened had the USSR retained political authority and central planning. 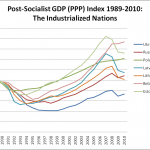 On the other hand, there does not appear to be any good reason that the USSR should have experienced a productivity spurt relative to the US; if anything the reverse as demographic prospects were deteriorating by the 1980’s (especially the pool of surplus rural labor was drying up) and resources for higher investment rates were hard to find (due to the demands of the MIC, and falling oil prices). Indeed, Goskomstat planners in the late 1980’s assumed growth to the end of the millennium would be around 1.5% per annum, i.e. even further decline relative to the US. In the big picture, Russia exchanged a very punishing transitional depression for the prospect of normal market growth, which has predominated since 1998, and the longterm possibility of real convergence. Another interesting set of countries Russia can be compared to are Fennoscania, though with a word of caution – Sweden, Norway, and to a lesser extent Finland were in literacy (human capital) terms far ahead of the late Russian Empire. Note that Finland, relatively backward nonetheless, declines more relative to the US than its Nordic neighbors; again, presumably a function of its initial backwardness (highly rural, can’t grow fast). Its performance in the 1930’s is every bit as impressive as Russia’s, and unlike the USSR, it continues to rapidly converge with US living standards from the 1960’s onwards. Note that Finland was only a modestly richer subject of the Russian Empire in 1913 than the national average. 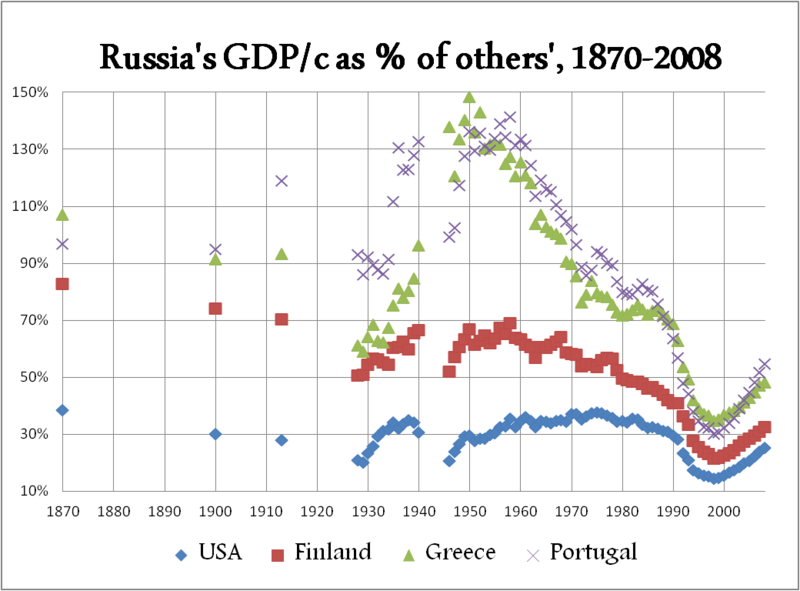 The final graph shows Russia’s historical performance relative to the US, Finland, Greece, and Portugal all in one. It is particularly telling that plotted against Finland, it is a story of almost inexorable decline during the Soviet period. While Russia did makes massive gains vis-a-vis Portugal and Greece under Stalinism, both the latter grew far more quickly during the 1950’s and 1960’s, with the result that they overtook the USSR in per capita terms at around 1970 and held a substantial lead by the 1980’s. This substantial gap became an awning abyss during the catastrophic nineties, however it is important to emphasize that the economy of the 1990’s was for the most part still a continuation of (well, the dissolution of) the stagnant Soviet command economy. There are of course many caveats. Some might argue that what the USSR suffered from in inefficiency it made up for in more focus on developing human capital (which is the single most important factor for long-term productivity growth). I don’t see this as convincing. As mentioned above, literacy rates by the 1910’s were above 40%; the school enrollment figures of the mid-1910’s would only be reattained in 1925. It is simply wrong to say that the Tsarist regime neglected human capital, it was just developing it from a lower base and the Soviets merely took over that process. The two biggest problems were that (1) the Soviet economy was seemingly unable to develop to more than 40% of the US per capita level, due to its inefficiency – that was its ceiling; and what’s worse, (2) it could not be dismantled without incurring a hyper-depression in the meantime. 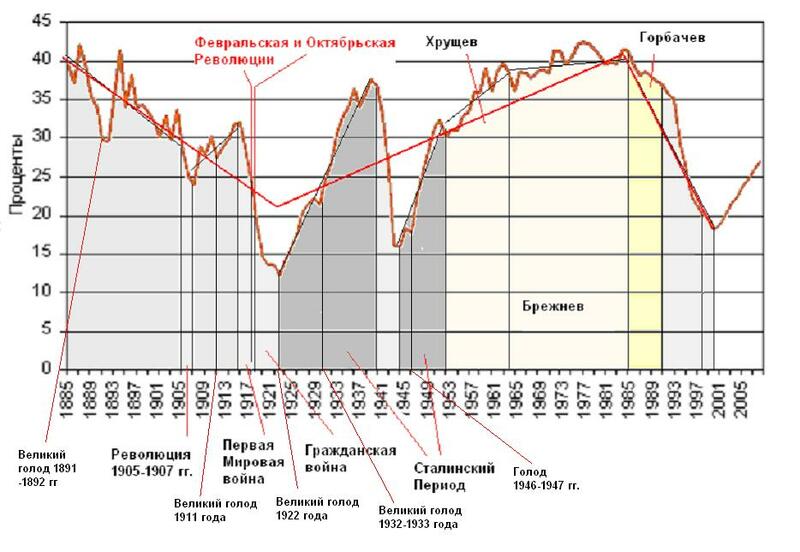 That second point is the reason why many Russian leftists continue to insist that the Soviet economy was a good thing, at least it held steady relative to the Americans under Brezhnev as opposed to collapsing in the 1990’s (which is in actuality the collapse of the Soviet economy), and being on the retreat throughout late Tsarism (for aforementioned structural reasons, but whose negative influence was weakened from the 1900’s); they also for some reason think that a GDP per capita at 40% of the US level is something to be proud of.